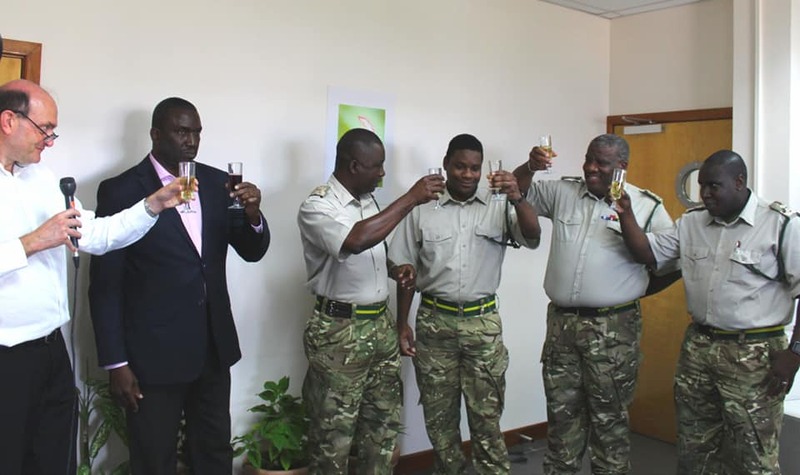 Second Lieutenant in the Royal Montserrat Defence Force Darion Darroux was officially welcomed home Wednesday with champagne toasts during a brief ceremony at the Governor’s Office. At end of March, Darroux successfully completed an eight-week Reserve Officers Commissioning Course at the prestigious Royal Military Academy at Sandhurst. Premier Donaldson Romeo and 2nd Lt Darion Darroux of the RMDF. Governor Andy Pearce said the officer had impressed the British armed forces minister Mark Lancaster on his visit to the island last year. Lancaster was also in attendance at the graduation ceremony. Governor Pearce said 2nd Lt Darroux embodied self-discipline, the desire for personal development and service to the public. Major Alvin Ryan, who leads the local force said he sleeps well at night knowing that people like Officer Darroux are in the ranks of the organisation, which is over 100 years old. 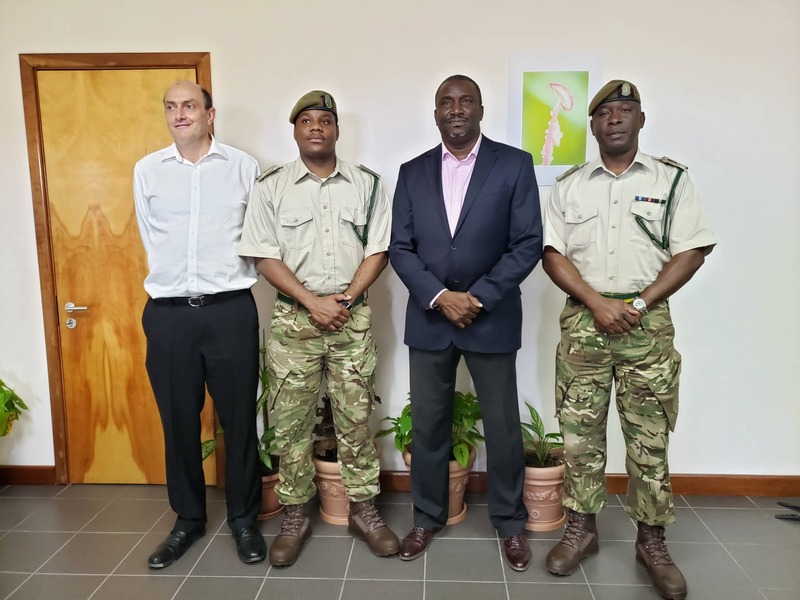 He thanked Defence advisor Colonel Anton Gash who continues to deliver for Montserrat. Darroux said it was a privilege to have been trained at Sandhurst, which he counts as a personal and professional accomplishment. His aim, he said is to deliver training on island and better the young people and soldiers of Montserrat. 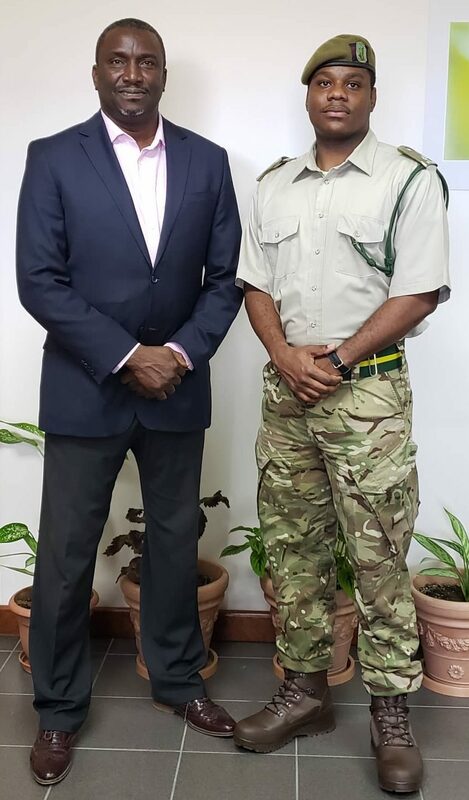 The officer, who works at the Integrated Border Security United, began his para military career with the the Montserrat Secondary School Cadet Corps. Governor Andy Pearce, 2nd Lt Darion Darroux of the RMDF, Premier Donaldson Romeo, and Major Alvin Ryan of the RMDF.